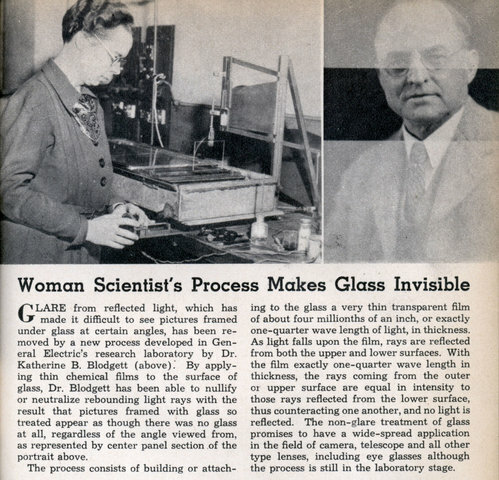 GLARE from reflected light, which has made it difficult to see pictures framed under glass at certain angles, has been removed by a new process developed in General Electric’s research laboratory by Dr. Katherine B. Blodgett (above).” By applying thin chemical films to the surface of glass, Dr. Blodgett has been able to nullify or neutralize rebounding light rays with the result that pictures framed with glass so treated appear as though there was no glass at all, regardless of the angle viewed from, as represented by center panel section of the portrait above. The process consists of building or attach-ing to the glass a very thin transparent film of about four millionths of an inch, or exactly one-quarter wave length of light, in thickness. As light falls upon the film, rays are reflected from both the upper and lower surfaces. With the film exactly one-quarter wave length in thickness, the rays coming from the outer or upper surface are equal in intensity to those rays reflected from the lower surface, thus counteracting one another, and no light is reflected. The non-glare treatment of glass promises to have a wide-spread application in the field of camera, telescope and all other type lenses, including eye glasses although the process is still in the laboratory stage. Has this something to do with polarization? Also, it could be worse: they could have written “Lady Scientist”. Charlene: Not at all. It’s just very good at transmitting light. Polarization blocks light depending on its orientation. Antireflection coating is what made all modern camera lenses possible. You almost certainly have numerous optical gadgets in your house with this kind of coating on them. It’s an important invention. Following a link in the Wikipedia article, it turns out that while Lord Rayleigh discovered the principle, and noted that some forms of glass tarnish so as to produce an antireflection coating naturally, one can indeed credit Dr. Katharine Blodgett as the inventor of artificially applied antireflection coatings. The kind we use now, with substances like magnesium fluoride, was invented earlier – in 1935, by one Alexander Smakula – but that invention was not publicly disclosed at the time. 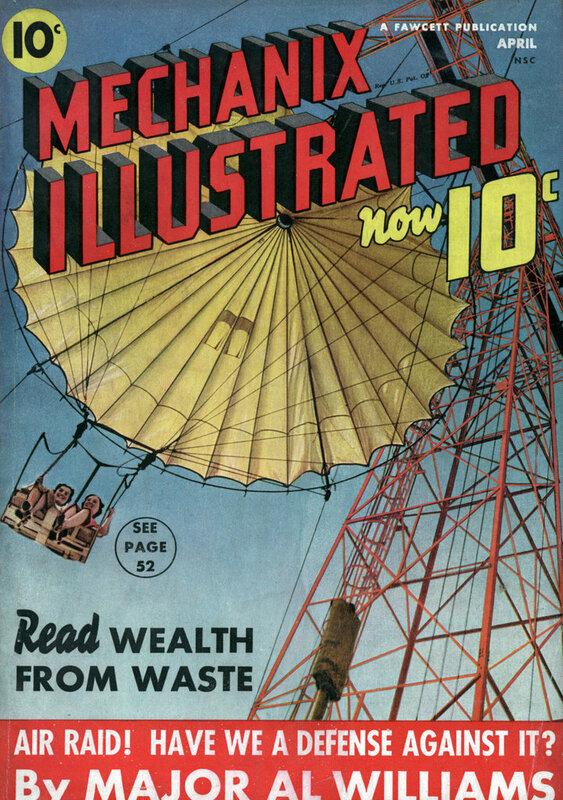 Instead, it was kept a secret until coated optics used by German forces in World War II were captured by the Allies, and the war started several months after this magazine was published. Actually according to my professor anti reflection coating was invented by Zeiss when they found out that one employee was linked to making considerably better optics. They analyzed the problem and found out that he was using a cream on his hands which got transfered onto the lenses and by polishing got down to about a quarter wavelength thus eliminating reflections. Casandro: Your professor is full of it. The physicist’s name was Alexander Smakula and he invented the first practical process to apply anti-reflective coatings. Charlene, I get the humorous pun in your comment #1. The responses you got just increased the possible point! Am I off base? There really should be a medical term for people who see puns that aren’t there. Firebrand38: I’ve added “punpetophilia” to my “Names I’ve Been Called” list. I can see clearly now. Thanks! William Deering: No that’s your condition. I would have to call you a punpetophile to make the list. What got me thinking about this was years ago I was watching the comedy movie “Airplane!” with a friend. The opening credits had started and he started laughing even though nothing had happened. It seems that he knew Robert Stack was in this movie and when he saw the name of the star of the movie (Robert Hays) he thought that Robert “Hays” was a pun for Robert “Stack”. Hays….Stack. Definitely a punpetophile as well. I have been hunting for more information on this. It was in 1904 that Harold Dennis Taylor attempted to use an acid treatment unsuccessfully to reproduce the effect of lens tarnish discovered by Rayleigh – or Fraunhofer. In 1933, a Zinc Sulfide coating for antireflection purposes was invented by A. H. Pfund. Perhaps this was the first successful artificial antireflection coating. While the magnesium fluoride coating discovered by Smakula in 1935 was kept secret by the Nazis until 1940, in December 1939 coated lenses were used on movie projectors showing the movie “Gone With the Wind”. And during the war, the process of baking coated lenses to make the coatings harder was developed by D. A. Lyon in the United States. Further searching shows that although the Germans tried to keep it a secret, a paper by John Strong in the January, 1936 issue of the Journal of the Optical Society of America described how to coat lenses with a quarter-wave coating of calcium fluoride, so, given that Smakula’s work was kept secret, this, rather than Dr. Katherine Blodgett’s work, would be the starting point from which coated lenses derived prior to the Second World War. John Savard: Good job! Thanks for staying with this. And I found out that A. H. Pfund was an American, who was for a time a professor at Johns Hopkins, so his 1933 work did not disappear the way that Smakula’s did. So he seems to be the inventor of the modern optical coating – even though some sources note that work was done on antireflection coatings even during the first World War. if what they are saying in this article is true and the process truly does cancel out light making it so that none is reflected, it would be equivalent to just having it absorb light, inotherwords, they just invented black paint on glass. for something to be invisible, it would not cancel out light but let light go through it (like say a normal piece of glass) or bend light around it. This one woman did so much for the women’s lib movement! She also revolutionized the glass industry!